Bishop Conry confesses he has been “unfaithful to my promises as a Catholic priest”. The leader of the Church in England and Wales, Cardinal Vincent Nichols, has described the shock resignation of Bishop Kieran Conry as “a sad and painful moment”. In a statement being read out in churches across the diocese of Arundel and Brighton on Sunday, Bishop Conry confesses he has been “unfaithful to my promises as a Catholic priest”. The 63-year-old explains his actions were not illegal and did not involve minors, but apologises to “all to the individuals hurt by my actions” and “all of those inside and outside the diocese who will be shocked, hurt and saddened to hear this”. The news has sparked a flurry of speculation as to the nature of his infidelity with the Daily Mail newspaper claiming it relates to one of two affairs, including one with a married woman. Bishop Conry studied for the priesthood at the Venerable English College in Rome and was ordained in 1975. 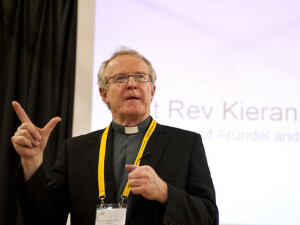 In 1994, he was named the Director of the Catholic Media Office in London, where he served until 2001, when he was appointed the fourth Bishop of Arundel and Brighton by Pope John Paul II. He is considered to be more liberal than other prelates and had been chairman of the Church’s evangelisation committee in England and Wales.